One of our main goals at One Small Child is to help make your event as enjoyable and memorable as possible. So, today we’re sharing some Christening tips to help your little one’s religious debut go smoothly. 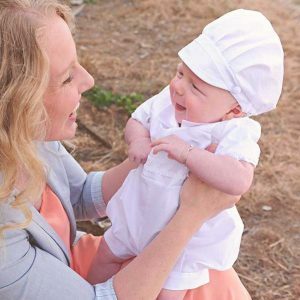 Plan the Christening at a good time of day for baby. If at all possible, schedule it around nap and feeding times, so he will be his happiest self! Pack everything the day before. Gather everything you’ll need including any paperwork, all the diaper bag essentials, Christening outfit and accessories, etc. Press or steam baby’s outfit and your outfit so they’re ready to go. Bring a folder for your little one’s Baptism/Christening Certificate and any other paperwork the clergy may give you. You’ll need this certificate for many religious events in the future. Having a special place for it will help you keep track of it through the bustle of the big day. Get a Christening bib! Especially if you plan on keeping your outfit as an heirloom. Or if your little one is wearing an heirloom gown. This can save your Christening outfit. Give yourself plenty of time. You may be asked to arrive early anyway, but make sure to give yourself an extra few minutes on top of that as well. Both you and baby will be more at ease if you aren’t rushed and can take your time getting ready. If you arrive early, you can dress your little one after you arrive, give him a little snack, maybe play a game of peek-a-boo, etc. so he’ll be all smiles for the big event. It’s also a great idea to give him a fresh diaper right before the christening. A blow-out is less likely to occur with a new diaper. Dress your little one at the church. Especially if you have a gown. There’s no way an heirloom-length gown is fitting in a car seat. You won’t want to chance baby spitting up or dirtying his outfit during the car ride. Warm car seats are sure to set wrinkles in freshly-pressed outfits. So, take it from us. He’ll be much more comfortable, and you’ll be less stressed if you dress baby at the church. Invest in an after-Christening outfit. Your little one will be easier for guests to hold and love on in a comfy outfit rather than a long silk dress. You’ll be much less worried about keeping it clean as well. Take a deep breath and roll with whatever comes. If something threatens to ruin baby’s perfect event, just smile and handle the situation with grace. You set the tone. Your guests and baby look to you for how they should react to less-than-perfect issues. It’s important that you keep a good attitude. It may drive you nuts today, but turn into a funny memory that you can laugh about later. We hope you enjoy this blessed occasion and we wish you a wonderful event!